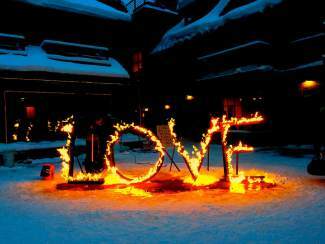 Fire sculptor and former Summit County resident Keith D'Angelo's piece "Love." D'Angelo and other fire sculptors will be displaying their artwork at the Fire Arts Festival today through Sunday. The sculptures will be lit every hour on the hour from 5â9 p.m.
2 p.m., Starbucks, 980 N. Ten Mile Dr. Come relax with a glass of wine or craft beer paired with a delicious small plate at Starbucks. 9:30 p.m., Snake River Saloon, 23074 Highway 6. Red Line Radio will be playing your favorite Rock/Dance hits. No cover with dinner. 6:15 p.m., Breckenridge Recreation Center, 880 Airport Rd. Adult/junior beginner drop in class is structured for anyone ages 8 and older. This introductory class teaches participants the basics and fundamentals of fencing. $5. (970) 547-4321. 6 p.m., Dillon Community Church, 371 E. LaBonte St. Summit County MOPS (Mothers of Preschoolers) is hosting the 2nd Annual Mother & Son Dance. Superhero themed. Tickets can be purchased at Dillon Community Church, at the door, by calling (303) 912-2124 or email julie.andrews@live.com. Tickets are $15 per Super Hero son, $5 for each additional child.